What is the Epicenter of Venture Capital? Obvious answer: Sand Hill Road...right? Wrong: it is actually Burlingame, CA. Of course, I'm biased because I live in Burlingame. But, I believe this is the best location on earth for a venture capitalist. The reason is because the true epicenter of Venture Capital should be in the offices of startups and the garages of entrepreneurs. Certainly not in the often too-quiet and stale offices on Sand Hill Road. I am surrounded by startups. The central location of Burlingame on the Bay Area Peninsula allows me to connect more easily with entrepreneurs in the markets that I invest. 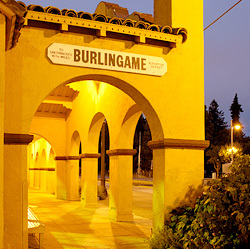 For those who don’t know, Burlingame sits directly between downtown San Francisco and the heart of Silicon Valley. And, it is also about 5 minutes from SFO. I try to spend most of my time out of the office. If I am sitting in my office in front of my computer, I am failing as a VC. Where do I really want to be? I'd rather be in SF meeting with the next hot mobile or consumer internet startup. Or, in San Mateo meeting with the next category-leading SaaS company. Or, meeting with one of my 3 investments in SF or my 3 investments in Burlingame/San Mateo. I take as many meetings at The Creamery in SF or Le Boulanger in San Mateo as I do in my office on Sand Hill Road. But, mostly I like visiting entrepreneurs where they work. That is the best way to learn - by listening, seeing and feeling what is going on at a startup. Inside the walls of a VC office is not the best place to truly understand entrepreneurs or startups. So, for me, living in Burlingame means that I sit right in the epicenter of my business. Don’t get me wrong, I have plenty of meetings at InterWest's offices on Sand Hill including many important meetings with my Partners. And, I’m willing to get on a plane to find great teams and companies. In fact, I have investments in Austin, New York and Seattle. This post is not meant to be a public service announcement for Burlingame. But, hopefully it gives entrepreneurs a better sense that I can get to them very easily and I would rather meet at your offices than my own, if at all possible. Thanks a lot that you have give me a right information about venture capital.Like other people I also thought that the Epicenter of Venture Capital is in Sand Hill Road.But you have made me right and so I am really grateful to you. Si può indossare queste scarpe da ginnastica senza calze divertirsi con il massimo comfort, che è disponibile presso i rivestimenti di pelle di pecora sontuoso. Ogni parte è Borse Hermes sicuramente realizzato con cura. Il più alto bordo del bagagliaio ha fodera in lana solo per salvarlo da sfregamento per la gamba. Questi stili di avvio sono inoltre progettati con suole di gomma pieghevoli per. Interesting. Thanks for the reading, it was a very interesting topic. I would appreciate you that you pick up an important topic to write a thoroughly informative post on.